Ghosn waves to reporters as he leaves a meeting with Prime Minister Theresa May in London. LONDON -- Nissan CEO Carlos Ghosn said he was confident the UK would remain a competitive place to do business after meeting with Prime Minister Theresa May. 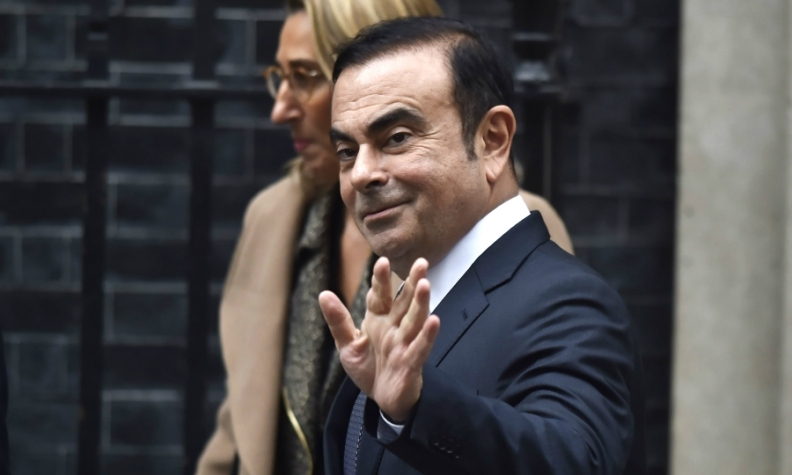 Ghosn had earlier warned that the Japanese automaker could halt investment in its British car plant after the country's vote to quit the EU. "Following our productive meeting, I am confident the government will continue to ensure the UK remains a competitive place to do business," Ghosn said after he met May on Friday to seek reassurance over the impact of Brexit. The UK will begin official divorce talks with the EU by the end of next March. May said she wanted to continue to back the country's car industry. "We will continue to work with Nissan as we develop the environment for competitiveness of the automotive industry here in the UK to ensure its success," she said after meeting Ghosn. Ghosn said at the Paris auto show last month that future investment Nissan's plant in Sunderland, northern England, would depend on a guarantee of compensation if the UK's eventual deal with Europe led to tariffs on car exports. After speaking with May, Ghosn did not disclose whether the issue of compensation had been raised. He said it was important that the Sunderland facility, which directly employs 7,000 people and many more through the supply chain, remains one of the automaker's most efficient plants. "We want to ensure that this high-performing, high-employment factory remains competitive globally and continues to deliver for our business and for Britain," Ghosn said. Nissan's Sunderland factory is UK's biggest with annual production of just over 500,000, accounting for just under a third of Britain's 1.6 million car output last year. The plant produces the Nissan Qashqai, Note and Leaf models and Infiniti QX and QX30, according to Automotive News Europe's Guide to European Assembly Plants. Nissan will decide by the end of the year whether to build its new Qashqai compact SUV in Sunderland, a source told Reuters. The current Qashqai went on sale in 2014. "The decision-making process is in the next few weeks and months with a decision expected before the end of the year," the source said, adding that the location might not be announced until early next year. At the Paris show Nissan Chief Performance Officer Trevor Mann declined to give assurances that the Juke subcompact SUV, which is due for renewal in 2018, will continue to be built in Sunderland. Businesses have been concerned that the UK is headed towards a "hard Brexit," which would leave it outside the EU single market and facing tariffs of up to 10 percent on car exports. Ghosn's concerns led other automakers to warn about the consequences of a hard Brexit, favored by some Conservatives who wish to impose limits on immigration, a key concern of many voters who backed Brexit. The CEO of the UK's biggest automaker Jaguar Land Rover, Ralph Speth, told Reuters that any Brexit deal would have to guarantee a "level playing field," opening up the possibility that others too would seek financial guarantees. Britain's largely foreign-owned car industry was a strong supporter of continued membership of the European Union ahead of the June 23 vote, benefiting from unfettered access to the world's biggest trading bloc and its standardized regulations. In addition to Nissan and Tata Motors' JLR, Toyota and Honda build cars in the UK, along with BMW Group's Mini and Rolls-Royce brands, Volkswagen Group's Bentley, and General Motor’s Vauxhall unit.